I can’t imagine that there’s much more work to be done in completing this mural…but then again, I’m not the artist, so I can’t fairly judge what else he/she/they might have planned. You can click on these earlier posts’ titles to see the progress that’s been made since the beginning of the work…City Paint 6.1 – Becoming, and City Paint 6.2 – Progress Report on “Becoming,” or you can scroll to the bottom of the page and select the “Street Art – Graffiti” category to view the complete City Paint series. This entry was posted on May 11, 2012 by seekraz. 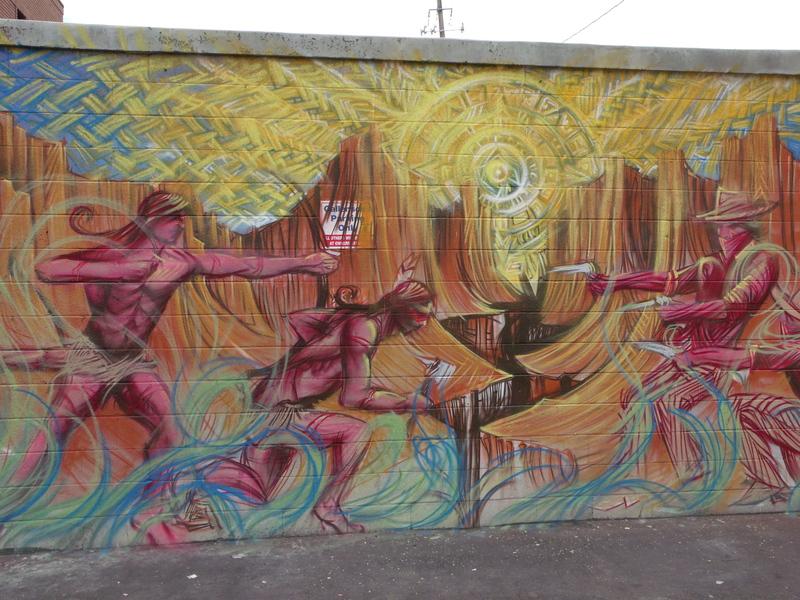 It was filed under Photos - Outdoors, Street Art - Graffiti and was tagged with art, art graffiti, arts, City Paint 6.1 - Becoming, City Paint 6.2 - Progress Report on "Becoming", graffiti, paint series, photography, Salt Lake City Utah, street art. I’ve been wowed by the process but now I wonder what the meaning of this mural is supposed to be? What is the message? I have been wowed by the process, as well, Allen…and can only imagine what the meaning or message might be. It is on the wall behind a gun store…and this, Utah, is part of the “far-west,” so maybe it’s a depiction of the early need for weapons out here. We could certainly get philosophical and sociological on the whole thing and mention genocide, Manifest Destiny, oppression, thievery…etc, etc…and we wouldn’t be wrong. True enough, and other people have produced artworks about people killing people-Picasso’s “Guernica” is a good example. But, since my family landed on the shores of Massachusetts in 1638 and surely must have played a big part in killing off the natives, depictions such as this always bring me a sense of shame and regret and make me wish I could go back and change things. Unfortunately, we all know what a watse of time that is. You’re welcome Scott. You said that beautifully, and I agree. This really is a fabulous mural.. thanks for following up on it Scott. What an interesting mural and interesting story-art! There are many murals on buildings in Phoenix now too. Have you seen any of them? I wonder if perhaps there is a trend starting. 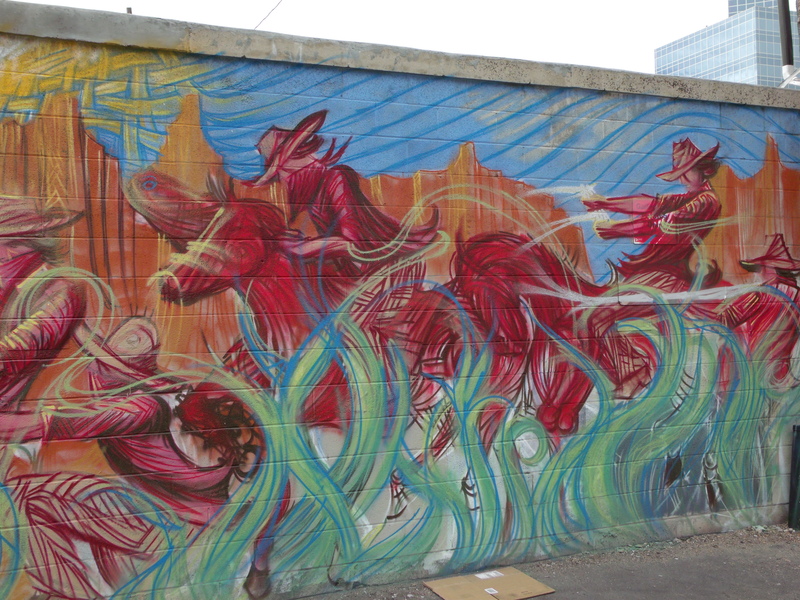 Thank you, Montucky…it’s been fun watching the mural develop over the last several weeks. 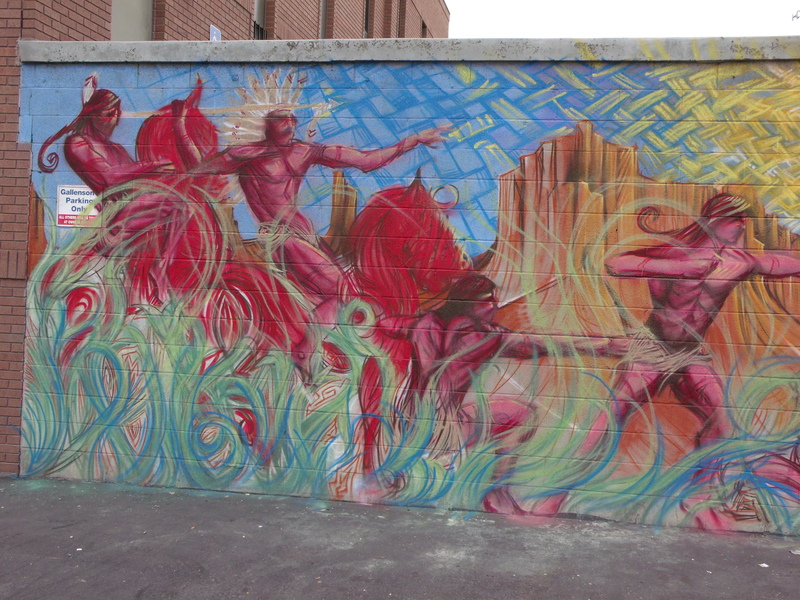 And I had visited another blog that had scores of street-art murals in Phoenix…but don’t recall ever seeing anything aside from graffiti during the twenty years that I lived there. My last ten years living there, however, entailed a job that didn’t get me out of the office and I didn’t often travel down into Phoenix-proper other than for work. I still have family down there…so I might have to go exploring the next time I’m down there for a visit. It would be interesting if there were such a trend moving from city to city. Imagine the beautiful art we’d see, reflecting each area’s local flavor and talent. Panel 2 showing the bows and arrows against the guns seems to sum up the brutal unfairness of the plight of the natives. They were always on a hiding to nothing. Great art, I’m really pleased you’re giving it a wider audience. I love the swirly lines, it looks so fluid. It also looks like it is done with chalk, the colours really look like chalk. I had to examine those lines carefully, Leanne; I thought the same thing…but it’s definitely paint, and not chalk. Thank you for exposing us to a unique part of the world we probably would never have the opportunity to see. And I am sure the artist would thank you too! Stunning work and well captured. Thanks for bringing this onto your blog for a wider audience.